GARDENA, Calif. – May 3, 2016 – Carroll Shelby International and the Carroll Shelby Foundation will host the fourth annual Carroll Shelby Tribute and Car Show on Saturday, May, 21, at the organization’s headquarters in Gardena, California. This family-friendly event will celebrate Carroll Shelby’s life and legacy by showcasing the Shelby Hertz “Rent-A-Racers,” the Shelby G.T.350 and the Ford GT. A tribute to Shelby’s fun- loving lifestyle will include a Terlingua-inspired chili bar with Shelby craft beer. Gates open to the public free-of-charge at 9 a.m. PDT; while free admission walk-ins are welcome, a $10 donation to the Foundation includes a special souvenir show decal. 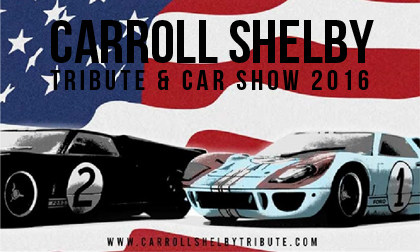 All Shelby and Ford performance car owners interested in displaying their vehicles at the show can register on the Carroll Shelby Tribute website for a $40 donation. Attendees will feast their eyes on some of the rarest Shelby and Ford cars from the past five decades. Shelby American will display its latest lineup of performance vehicles including the all-new Shelby Terlingua and Shelby Super Snake. Carroll Shelby’s Store will open with its latest line of merchandise for high-octane enthusiasts. Enthusiasts across the globe are invited and encouraged to join the “Rev Your Engine” salute to uniquely honor the life and astonishing legacy of Carroll Shelby at 1 p.m. PDT. With the recent loss of Carroll Shelby’s nine-year-old great grandson, Lloyd Randall Shelby, the Foundation will make a special presentation in his honor at the event. Lloyd was a huge fan of both his great grandfather and the Shelby cars he created. To learn more about the 2016 Carroll Shelby Tribute and Car Show or the Carroll Shelby Foundation, please visit www.carrollshelbytribute.com or www.carrollshelbyfoundation.org. The Carroll Shelby Foundation was created by legendary racer and automotive manufacturer Carroll Shelby. Headquartered in Gardena, Calif., the Foundation is dedicated to providing medical assistance for those in need, including children, educational opportunities for young people through automotive and other training programs and benefitting the Shelby Automotive Museum. For more information, visit www.shelby.com. Shelby American (www.shelby.com), a subsidiary of Carroll Shelby International, Inc., manufactures high performance vehicles created by automotive entrepreneur Carroll Shelby. The company is involved in vehicle manufacturing, design and engineering projects under a license agreement with Carroll Shelby Licensing, Inc.